﻿ Chicago Hispanic Newspaper, Lawndale News, Hispanic Bilingual Newspapers, Su Noticiero Bilingue » Remember good old breakfast, lunch and dinner? April 24, 2019 8:48 am You are here:Home Health Remember good old breakfast, lunch and dinner? Posted by Editor on February 2, 2017 in Health | Comments Off on Remember good old breakfast, lunch and dinner? Americans have pretty much thrown that out the window, the American Heart Association says. And that may affect how much weight we are putting on. In fact, it might be a good idea to plan when to eat as much as what to eat, the group says in a new scientific statement. “This study clearly demonstrated that adults in the United States eat around the clock,” the American Heart Association says in the statement, published in the journal Circulation. It’s still not 100 percent clear if it’s better to eat breakfast every day, or to eat less after 6 p.m. But a growing body of evidence does suggest that breakfast is good for you and that eating late at night can help you put on more pounds, even if you skipped meals earlier in the day. “Meal timing may affect health due to its impact on the body’s internal clock,” said Marie-Pierre St-Onge, an associate professor of nutritional medicine at Columbia University who helped write the statement. Animal studies show that eating right before sleep might alter metabolism not only to promote weight gain, but in harmful ways that could help lead of diabetes and heart disease. “However, more research would need to be done in humans before that can be stated as a fact,” she said. And more people are eating late because more people are eating at all hours, the Heart Association team found. Between 1971 and 2010, the percentage of men who eat three squares a day fell from 73 percent of men in the 1970s to 59 percent in 2010. 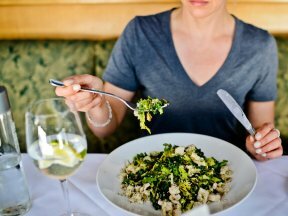 While 75 percent of women said they ate three meals a day in the 70s, by 2010 just 63 percent did.